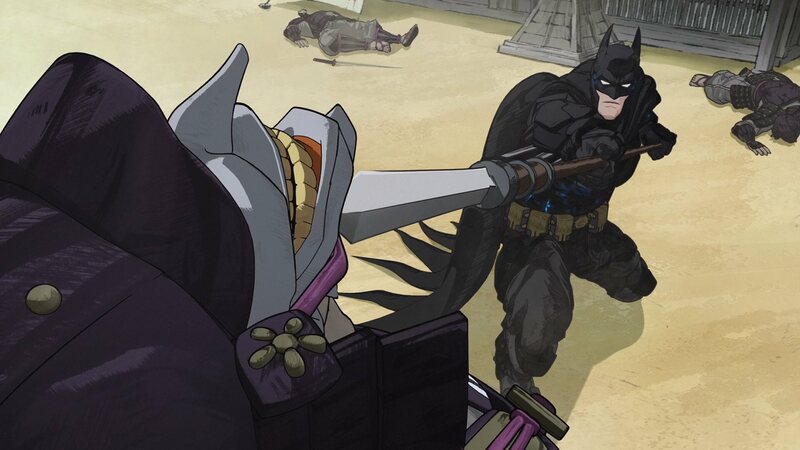 At one point early in Batman Ninja, Lord Joker's ancient Japanese castle sprouts robot arms that chuck oversized shuriken at the Batmobile, for all the good it does. Cornered moments later, Lord Joker gives the Dark Knight a choice: capture him or rescue a mother and child from being crushed by one of those gigantic cyber-hands. Batman blasts off in the Batcycle (we're, like, three Bat-vehicles deep in the space of a single sequence), racing the rapidly plummeting hand to ground level. Once those tires do touch down, the movie sets aside the whole rescue angle for a moment, forgetting about mommy and daughter in favor of a brawl with Sumo-Bane. Sure, this morbidly obese take on Bane may have a few hundred pounds on ol' Bats, but the odds are quickly evened as the Batcycle transforms into mech armor. 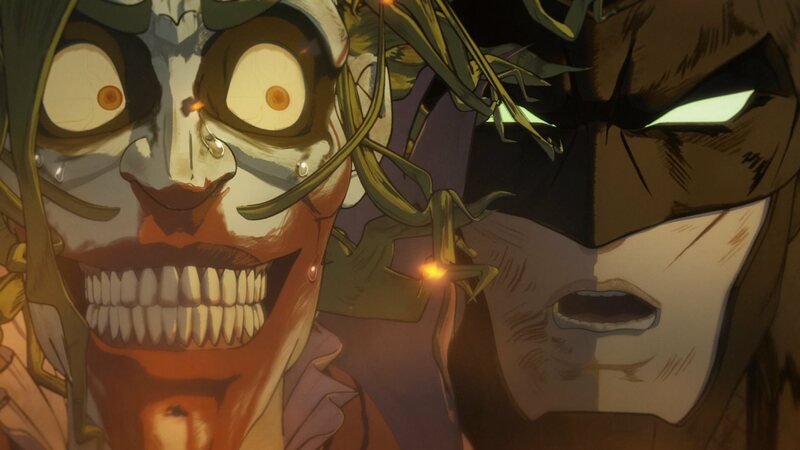 Pretty much every scene in Batman Ninja is as gloriously unhinged as that. I mean, before we're even two minutes in, the Dark Knight has already been flung through time back to feudal Japan by a talking gorilla. 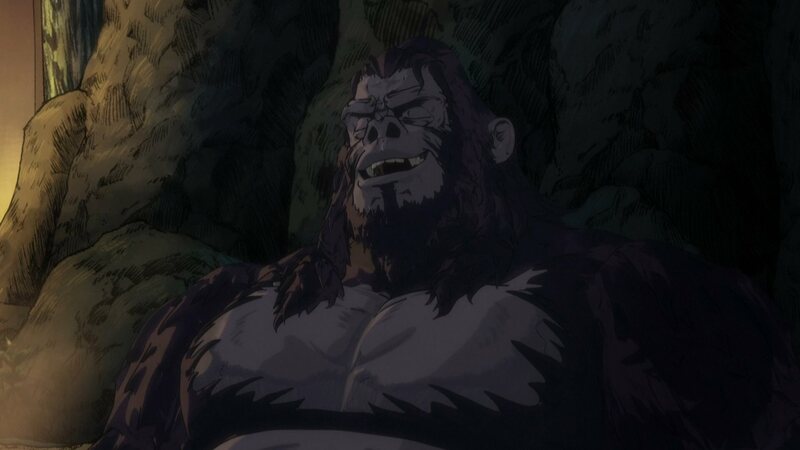 Not that a coherent narrative is perched atop Batman Ninja's list of priorities, but the story goes something like this: Gorilla Grodd is tired of all the lesser criminals in Gotham City throwing a spanner into his machinations, so he decides to quite literally get rid of the competition. I mean, he could just snap their necks or feed them to feral pigs or something, but Grodd would rather send Arkham's inmates as far away as he possibly can. ...and, y'know, things don't get a whole lot further away from modern-day Gotham than feudal Japan. As plans go, it's...a plan, I guess, but here comes Batman to muck it all up. Don't sweat it, though. Batman is tossed through time as well; it's just that he lands two years after half his rogue's gallery and the entire Bat-family. This army of supervillains has spent the intervening years overthrowing feudal lords and battling each other for control over the entirety of Japan. It's a page out of history, just with more hyperintelligent gorillas and giant robots. The good news...? The Caped Crusader is not at a loss for allies, with Catwoman, Robin, Nightwing, Red Robin, and...why not?...even Alfred joining him all these centuries in the past on the other side of the world. 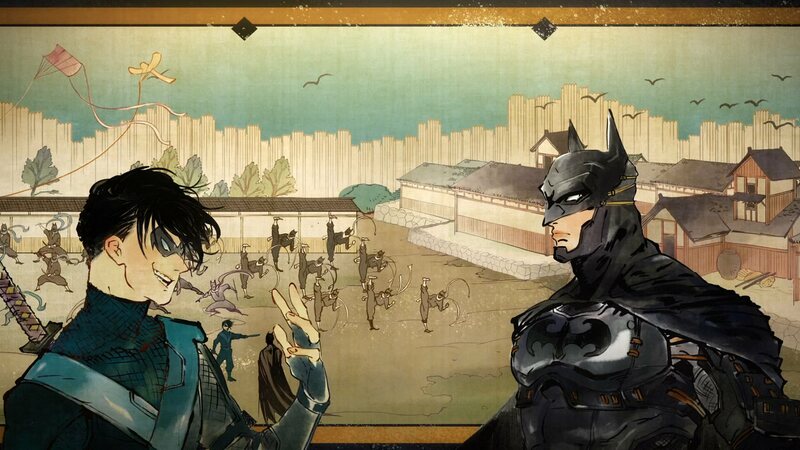 Even a good bit of Batman's tech found its way back to feudal Japan. He also makes some new pals since his coming had long since been prophecized. The bad news...? Not only is Batman literally a stranger in a strange land, but many of the crutches he's come to rely on are quickly stripped away. Without all those wonderful toys, what chance does he possibly have of taking down Gorilla Grodd, The Joker, Harley Quinn, Poison Ivy, Two-Face, The Penguin, and Deathstroke? I mean, a pretty good chance, what with all his friends, a ninja clan that worships him, and a Monchichi sidekick for whatever reason, but don't try to make sense of any of this. There's so much I'm aching to tell you about Batman Ninja. It's just that a key part of the fun is that jaw-agape sense of "I can't believe that just happened...! ", and if I spell too much out for you, then you'll believe it, I guess. At its core, that's what Batman Ninja is. We're not talking about style over substance because that suggests there's some degree of substance in the first place. You have a group of immeasurably talented artists and filmmakers from Japan indulging every wild idea and embracing every conceivable anime trope under the sun. Not a moment goes by without something strange, wonderful, and enthralling on the screen. Every "what if?" and "how about?" that the team in Japan brainstormed is unleashed at such dizzying speeds that the movie is completely incoherent. Beyond that, it has style to spare. Hey, why even bother settling for one style when there's so much out there to choose from? Thrill to "wait, what?" dialogue like this: "All for one, and one for all! Their combined spirit has formed this giant samurai! Now, witness the awesome power of the monkeys! Together, they will deliver a devastating blow!" This is an action spectacle like little else I've ever witnessed. 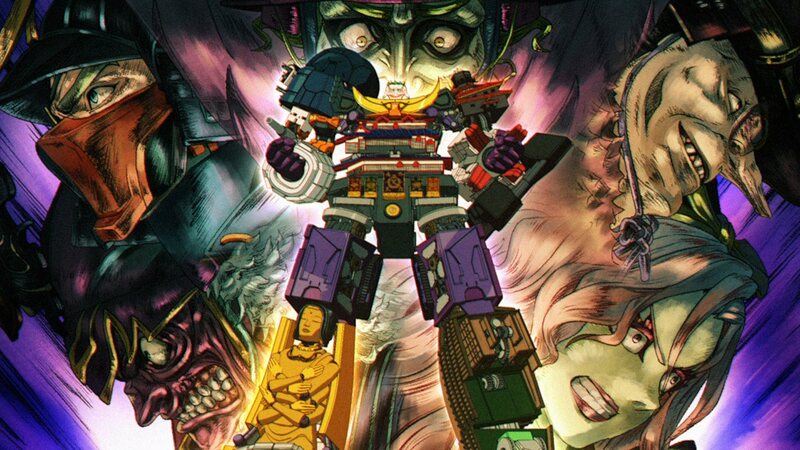 In with all the Howl's Moving Castle-dom, Voltron-ity, and Bat-emblem-head-shaving is perhaps the most astonishingly choreographed, unflinchingly brutal battles between the Joker and Batman in any medium. Infectiously fun. Indescribably gorgeous. Incoherently frenetic. Highly Recommended. It's not ruinous, and you may not even notice any of this, depending on the screen size and/or viewing distance in your particular setup. Still, since you're apparently the type of person who reads the technical sections of Blu-ray reviews, chances are that you'll notice that something doesn't look quite right. 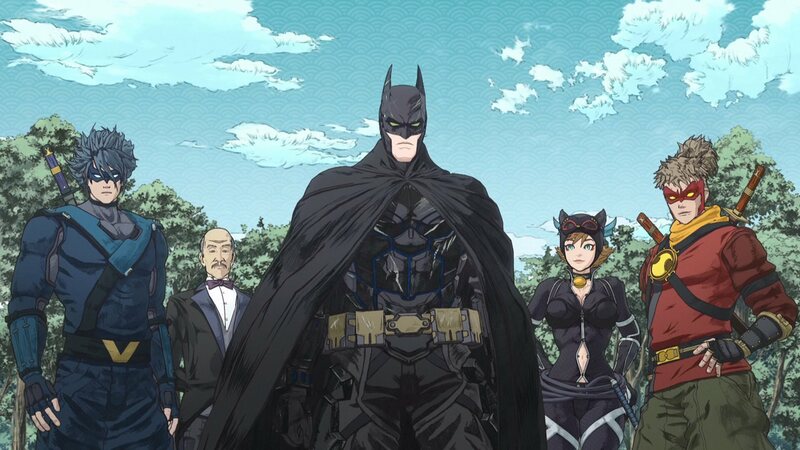 I'm not disappointed by this presentation, but at the same time, this isn't the best that Batman Ninja could've looked either. On a frame-by-frame basis, the striking visuals are otherwise reproduced beautifully on Blu-ray: richly detailed, generally crisp, and stylish as hell. The low framerate of Batman Ninja does result in some extremely choppy animation, although that's obviously not an issue specific to this disc. Part of me can't help but wonder how much more impressive the film would've been with less overtly CG imagery and with more fluid animation, but I'm still very much in awe of Batman Ninja's visual flair. I can only assume that a lossless Japanese soundtrack is one casualty of this already overstuffed disc. In fact, the Japanese audio isn't even available from the 'Setup' submenu; it's instead listed alongside the bonus features. Even the flipside of the case refers to it as "the original Japanese version", so it's a shame that it's saddled with plain-jane Dolby Digital 5.1 audio (640kbps) rather than getting the 24-bit DTS-HD Master Audio treatment that the English adaptation enjoys. We really should've been treated to both. Strictly on the technical end of things, though, the lossless English track is outstanding. The audio is immersive throughout and astonishingly cinematic. The heavy machinery – from the Batmobile all the way up to a skyscraper-sized Mechajoker – summon a hellish amount of bass and attack from every available direction. I can't get over how frequently the surrounds are utilized: swarms of bats, a badnik being spun around 360 degrees on a Bat-cable like a human centrifuge, barrages of more rockets than I could count, the flurry of hooves as the Bat-clan storms down a mountain on horseback, or a bomb spewing smoke to make for a quick escape, just to rattle off a few. This isn't a stereo track with some light reinforcement from behind; the rear channels are an inherent part of Batman Ninja's sonic vocabulary, and it makes for a rewarding listen on a proper home theater setup. There are a couple of scattered moments when I'd brace myself for a thunderous low-frequency assault only to hear what might as well have been a damp firework fizzling out, but by and large, the LFE snarls with nearly the same ferocity as a summer tentpole action flick. Basically, the scale and spectacle of Batman Ninja are colossal, and it has the soundtrack to match. "This penguin moves as swiftly on land as it does at sea! And it's got one hell of a bite!" "Hmmm, watch it, you bloated bird 'cause this plant bites back. And I'm gonna catch you in this flytrap!" "Don't underestimate the mobility of this Birdman Castle. As fast as the birds!" "You think you'll defeat me with that stomach bloated by greed?" 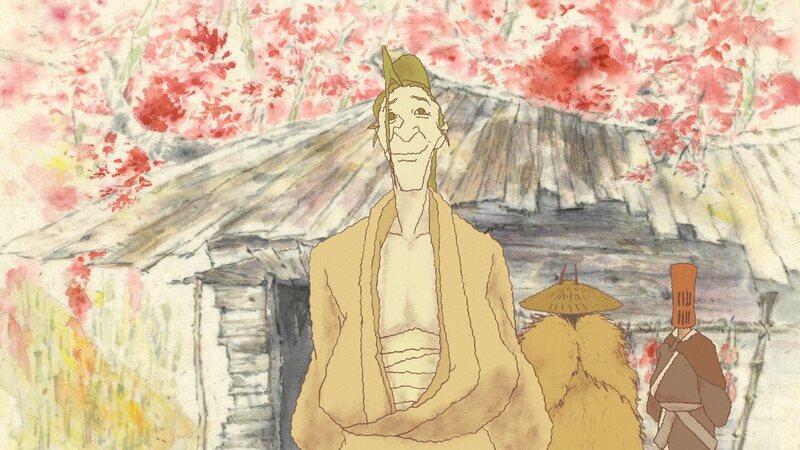 The English adaptation often feels clunkier to me than the Japanese dialogue – I may also be more forgiving of what I read rather than what I hear – and I'm not quite as fond of the voice acting either. 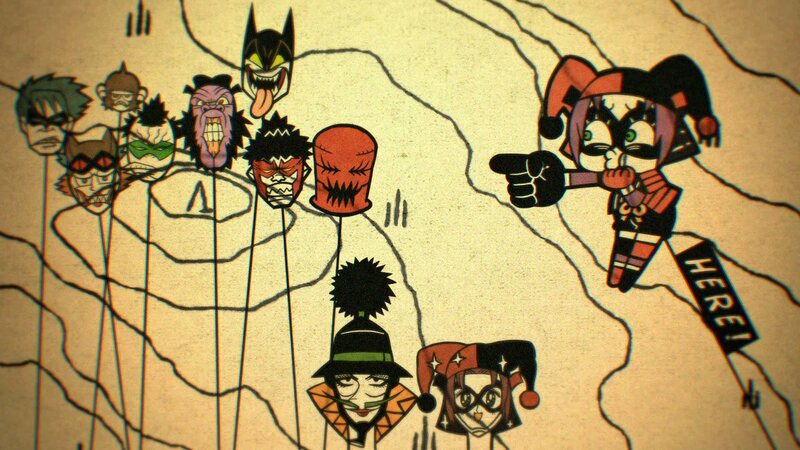 To be fair, most of the English language cast does a marvelous job, having played these characters in some form for years: Tara Strong as Harley Quinn and Poison Ivy, Roger Craig Smith as Batman, Grey Griffin as Catwoman, and Fred Tatasciore as Deathstroke (and also voicing Gorilla Grodd for the first time). Part of it's just my ears expecting to hear Japanese voices over such distinctively Japanese imagery, and part of it's because of Tony Hale taking the reins as the Joker. Hale's performance grew on me as Batman Ninja went along, but particularly early on, it struck me as excessively screechy and...I dunno, Peculiar Purple Pie Man of Porcupine Peak-esque. His Joker is grating enough to sour everything around it. Yuri Lowenthal is the other weak link as Robin. The sprawling list of other audio options includes Dolby Digital 5.1 (640kbps) dubs in French, German, Spanish (Castilian and Latin American), and Portuguese. Subtitles are offered in English (SDH for the English adaptation as well as a proper translation of the Japanese audio), Japanese (also x2), French, German (traditional and SDH), Spanish (Castilian and Latin American), Portuguese, Danish, Finnish, Norwegian, and Swedish. Original Japanese Audio: Um, see above. New York Comic Con Presents Batman Ninja (49 min. ; HD): Screenwriter Kazuki Nakashima, character designer Takashi Okazaki, and director Junpei Mizusaki are joined by English screenwriters Leo Chu and Eric Garcia for this NYCC panel. 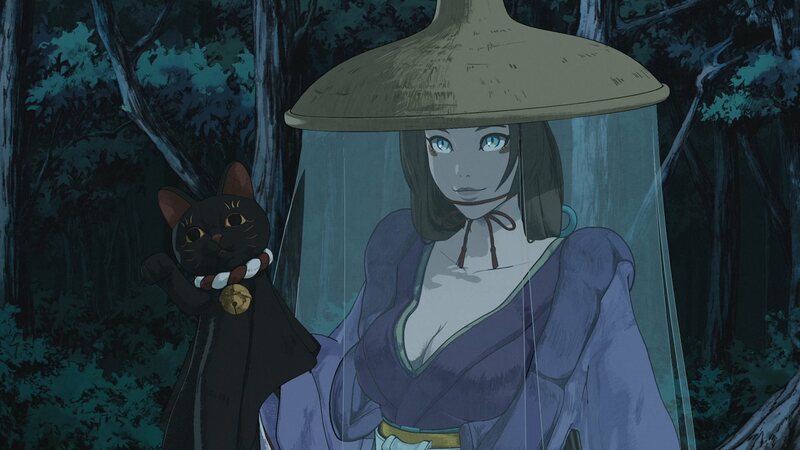 Among the topics of discussion here are the genesis of Batman Ninja, the perception of Batman in Japan, how the filmmakers honored these characters while still giving them a unique spin very much their own, what the most difficult character was to direct, the score by Yûgo Kanno, and how the fight choreography draws in part from live-action reference footage. Chu and Garcia delve into the challenges of adapting Batman Ninja into English, especially given that animation can sometimes be underway before even the Japanese dialogue is written. The English language voice actors weren't ready to be announced as this panel was underway, which does put a damper on the conversation. The panel discussion is followed by a Q&A session. Batman: Made in Japan (14 min. ; HD): The first of Batman Ninja's featurettes focuses primarily on character design, and I particularly enjoyed hearing what elements – whether it's from history or from your favorite Batman comics – helped to shape the look of these characters. For example, Lord Joker draws in part from Dutch colonialists, while Robin's hairstyle mirrors that of Daigoro in Lone Wolf and Cub. East/West Batman (17 min. ; HD): While "Made in Japan" concentrates on character design, "East/West Batman" delves into most everything else: how key elements of the Dark Knight translate so wonderfully to Japanese storytelling, how deeply the premise draws from history, the exploration of what Batman is when stripped of his arsenal and technology, cross-cultural influences, how the sound design extends to the thoughtful use of silence, the film being driven more by its visuals than by its narrative, and...hey, video game boss intros and colossal robot battles! Batman Ninja comes packaged in a slipcover, and a digital copy code and DVD are along for the ride as well. There's also a steelbook release, and it's more widely available than usual to boot. Don't make the mistake of walking into Batman Ninja expecting a traditional Batman story brought to life with anime flair. There's nothing the least bit traditional about this unapologetically ridiculous, deliriously over-the-top spin on the Dark Knight. There's barely even a story, with just enough of a narrative to loosely string together 85 minutes' worth of gonzo setpieces. This is destined to be the the most polarizing animated title that DC has released yet. Maybe you'll be entranced by its hyperkinetic visuals and batshit insanity. Maybe you'll be dumbfounded, wondering what the hell it is you just watched. Very possibly both. For my money, it's the sort of thing I'd excuse as being an experience rather than a movie. I'm floored that something this bold, this brazen, this...go-for-broke in every conceivable way even exists. 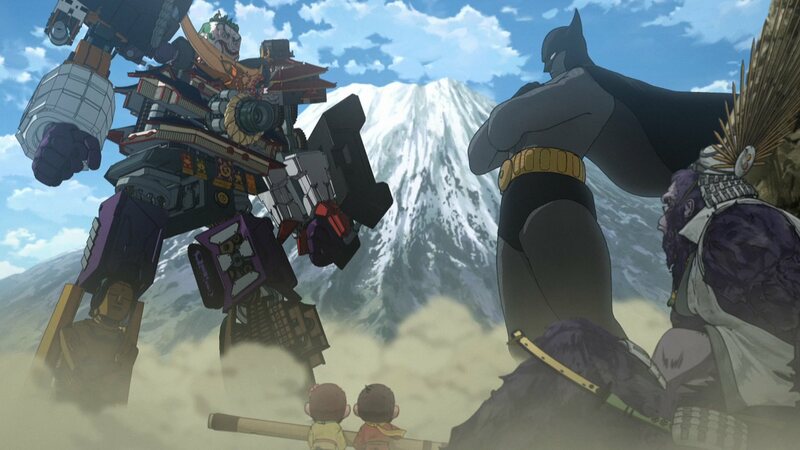 I love the hell out of Batman Ninja. It's a challenging recommendation because the movie is so far out there, but any Batman fanatic with even a little bit of a taste for the adventurous really ought to seek it out. I fully expect to get some blowback in the comments for this, but if Batman Ninja is willing to take so many risks, I might as well follow suit and say that this disc comes Highly Recommended.